hello, I enjoy playing overwatch and elder scrolls online mostly since that is all i have time for nowadays. i am currently in school studying to become a 3d environmental artist for video games. Welcome! I hope to see you around! Welcome to ADK! Hop on discord sometime and say hi. We have ADK Overwatch In-House events every Friday at 9pm EST, so make sure to come vote here on our next game mode! Welcome to ADK bud. If you're interested in playing OW join us in discord! Thats pretty cool. I know a couple people that work for IDV ( maker of Speedtree) and have always been fascinated by the work they do with that program. Welcome @DeathToast - thanks for stopping by, hopefully you've gotten a chance to hang out with our Overwatch folks. Look forward to seeing you around some more! 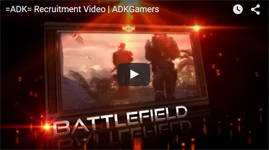 Welcome to the ADK forums @DeathToast Hope to see you around more.. If you have been to our discord yet You should We have a large Overwatch community They do inhouses every Friday Night! Welcome! Hope to play some OW with you sometime!